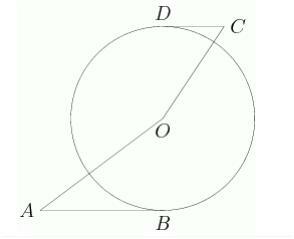 The radius of circle O is 12 inches and segment AB and CD are tangent to the circle at B and D respectively. AB= 16, and CD= 5 inches. What is OC + OA in inches? Feel free to post solutions or techniques, where later I will reveal the correct answer. The second you look at this problem, you think of making triangles by adding line segments DO and OB. Now we get two right triangles and we can easily find OA=20 and OC=13 through Pythagorean triplets. So our answer is 20+13=33.